Ever dreamt of living in France? 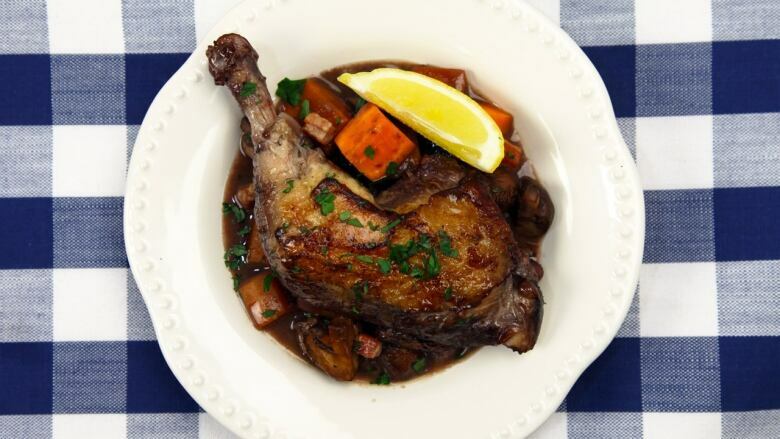 Try out Shahir’s recipe for Coq au Vin and you’ll experience the French countryside without ever leaving your home! Preheat oven to 300F. Heat the olive oil over medium heat in a large low dutch oven. Saute the pancetta until it is brown and crispy, 4-5 minutes. Remove from pan with a slotted spoon and set aside. Dry the chicken breasts off with paper towel and season with salt and pepper. Working in batches, brown the chicken pieces all over in the oil and rendered pancetta fat. Remove the chicken from the dutch oven and pour off all but 3 tbsp of fat. Add the carrots, onion, thyme and garlic to the dutch oven and saute until vegetables are softened and slightly caramelized, about 5 minutes. Sprinkle flour over vegetables and cook for 3 minutes. Add wine, brandy and chicken stock, season to taste. Return pancetta and chicken to pan, along with any juices that have come from the chicken Bring to a simmer on the stovetop over medium heat. Cover dutch oven with lid and bake in preheated oven for 45 minutes. Remove the lid and bake chicken for another 15 minutes. While the chicken is cooking in the oven, brown the mushrooms in a saute pan on the stove top. When the chicken is cooked, remove from the oven. Stir in the mushrooms, season to taste. Sprinkle with parsley and serve.